Civil War historians have long been puzzled by Pickett’s seemingly suicidal frontal attack on the Union center at Gettysburg. What followed was America’s greatest cavalry battle: 7,500 Confederate horsemen ranged against 5,000 Union cavalry, Jeb Stuart against George Custer, with the outcome of the Civil War at stake. Paul D. Walker decided on a military career after successfully serving two tours in Viet Nam. As a student of American and military history, he became fascinated with the vigorous art of cavalry warfare. 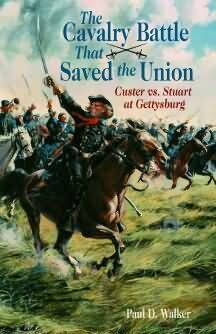 The lack of published information about the crucial cavalry battle at Gettysburg is what prompted Walker to write The Cavalry Battle That Saved the Union. He currently resides in Salt Lake City.